The Staffordshire Bull Terrier was brought into existence in the early 1800s and is a cross between the bulldog of the day and the old English Terrier – a breed which is now extinct. It was produced with the sole purpose of obtaining a dog with a longer, broader head than the bulldog and also able to combine strength and agility. 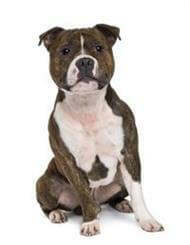 The early dogs did not have very specific Pedigree’s because the importance was a game-fighting dog. The miners and ironworkers of Staffordshire began to foster the breed and the qualities of gameness, intelligence and loyalty were developed. You must never forget the Staffordshire Bull Terriers’ past as a fighting dog is still present in most Staffords today. Their boisterous nature and spirit give credit to the statement that ‘Staffords are the loveable rogues of the dog world’. Always be a responsible Stafford owner and never have your dog off lead in a public place. Staffordshire Bull Terriers live happily with other pets provided that they are trained and socialised from an early age. Puppies can be easily trained to obey house rules and obedience training can be an excellent avenue to provide socialisation with other animals. Obedience is a fun way to develop a close bond of friendship and respect with your Stafford. They love to be with you and take great delight in pleasing you.